A French import introduces toddlers to the seven seas. 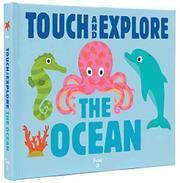 The deep blue sea and the creatures that call it home are the focus of this large touch-and-feel book. Little ones will learn about sharks, octopuses, manta rays, and all sorts of other ocean dwellers. The illustrations are serviceable though bland; Choux opts for representational accuracy rather than creative license in his depictions. This is a book that'll be particularly loved by aspiring marine biologists, filled with facts and detail. The textures (a dolphin’s “soft, flexible skin”; a sea turtle’s “hard shell”) will attract younger readers, but those just about ready for their first long picture books will get maximum value out of this read due to the book’s level of detail. Little readers uninterested in the difference between clownfish and lionfish might fare better with companion title Farm, by Xavier Deneux. That title covers the barnyard in a similar fashion but has simpler text to accompany the engaging textures.